Who hasn’t heard of, or used the expression “losing your marbles.” Metaphorically speaking, marbles seem to be equivalent to brains or at least wits. Or maybe marbles simply refer to a tenuous state of human sanity held in check by a hand drawn circle in the dirt. Knocked out of the circle, you lose. I got to thinking about this phrase which took me down a path to the game of marbles itself, which seems to have gone the way of hopscotch & jacks along with just about every other outdoor game that healthy young American children used to play before the advent video gaming and the computer vortex. I believe my generation, the baby boomers, were the last to play the “Great American Outdoor Games.” These included obscure fun rituals such as: ringolevio, capture the flag, stoop ball, jumprope and the like. After reflecting momentarily, I realized that I too had not actually been part of the “marble generation.” I missed it. Yes, we had marbles. Catseyes, those cheaply produced machine made glass orbs from Japan which flooded the American market in the 1950’s. But cateyes are to marbles, as cubic zirconium is to diamond. But what did we care? We were too busy flipping Maris & Mantle cards to think about winning a paltry marble or two. But there was a time… yes, way back, between the two world wars, when marbles had their glory days. A time of fantastic colors, swirls and sizes! A time when marbles were the equivalent of money to the kids who collected them. They were traded, gambled and played with for countless hours. This is not to say marbles were invented during the inter-war period. No, they have a much longer & more colorful history. Written of in ancient Roman texts, perhaps even the name marble was derived from the early round balls played with by Roman children. Clay marbles have been found the the tombs of the Egyptian pyramids and that of the Aztecs. In 1559, reknowned artist, Pieter Breugel the Elder, painted “Children’s Games” which depicts the outdoor playing of marbles in a town square. Even Shakespeare tells us of players who threw polished stones into holes in the ground. Marbles have been made of stone, marble, clay, china & glass. From the 16th century up til the mid 19th C., glass marbles were individually made one at a time. Then in 1846, Elias Greiner Vetters Sohn, a German glassblower, invented a tool called the marble scissors which enabled the manufacture to be quick enough to make the sale of glass marbles to the public an economic proposition. These marbles became increasingly popular throughout Europe and America. An enormous variety of colors were used and intricate patterns were created within the glass. The “scissors” literally cut the molten glass into shape at a rapid pace. These marbles all have the telltale “pontil” mark on opposite ends where the glass rods were cut. It wasn’t until the 1890’s when the first machine-made marbles were manufactured in Germany that the little glass balls were completely smooth and free of the pontil. 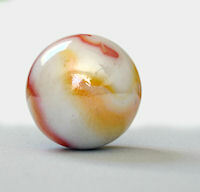 Most American children of that era were playing with the German made marbles until WWI put a stop to their importation. American kids thirst for marbles wouldn’t be quenched, so US glass companies began making them. So began the “Golden Years.” American marbles with names like Popeyes, Peltiers, Peerless Patches, Akro Agates and Corkscrews appeared. Every Five & Dime carried an array of marbles by manufacturers such as Master Marble, Vitro Agate, Alox Manufacturing, Champion Agate, Christensen Agate Company and Ravenswood Novelty Co. While many companies were losing their shirts during the Great Depression, American marble companies thrived. Things went well for the American marble industry until after WWII when the Japanese invented the ubiquitous Cateye marble, a super cheaply made mass produced marble of questionable artistic value. The Cateye put the cabash on the US marble industry, and it never recovered. Today, marble collecting has nothing to do with shooting marbles in a dirt circle. It’s all about rarity, condition, quality and original boxes. Some of the most sought after marbles today are sulfides and lutz’s. Sulfides are a 19th c. Victorian clear marble of large size which encase a cameo style figure in its middle. These often fetch between a hundred and two hundred dollars each. A high quality, hand made, 19th c. lutz marble can bring over $200.00 The lutz, whether an onionskin or swirl is any marble containing goldstone, which is aventurine glass that glitters with an unmistakable reddish brown due to the presence of copper particles. American marbles in their original boxes seem to be another hot area of collecting. Collectors seek mint condition boxes of marbles with colorful graphics as well as smaller run productions from short lived companies. Whatever direction you decide about collecting marbles, just make sure of one thing. Keep them in a safe place… because you wouldn’t want to lose them.